Home Climate Change What’s happening to the oceans’ phytoplankton? Research suggests that the oceans’ phytoplankton are declining in abundance in many places. 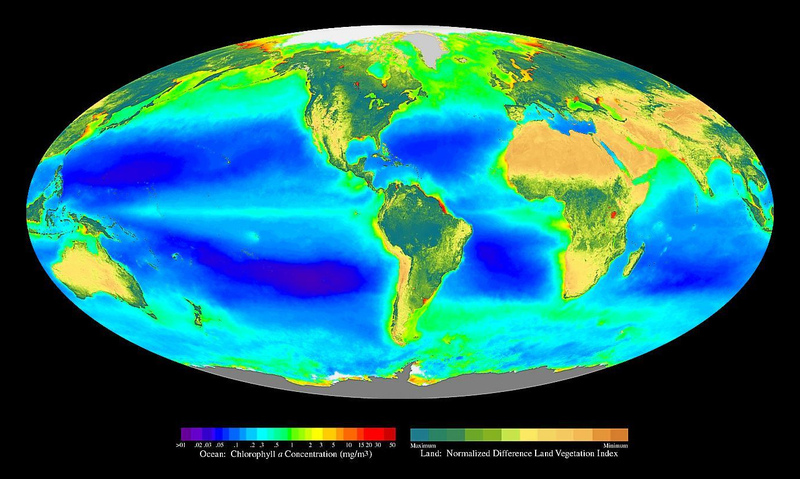 Global Biosphere September 1997 – August 1998 composite image showing the magnitude and distribution of global oceanic chlorophyll a and terrestrial primary production. But first of all, what are phytoplankton, and secondly, why should we be interested in what’s happening to them? Phytoplankton are microalgae that float, drifting in the seas’ sunlit surface. Although these microalgae are too small individually to be seen by your naked eye, collectively they are so numerous that they are the ocean’s main primary producers. Just like plants on land, the phytoplankton uses the energy in sunlight to combine carbon dioxide and water to produce sugar and oxygen in the process we call photosynthesis. To give you an idea of the significance of phytoplankton, it is interesting to compare them to the macroalgae – the seaweeds, with which most people will be more familiar. Collectively, the macroalgae, although much bigger, account for less than 5% of the total primary production in the sea each year. As primary producers the phytoplankton underpin the marine food chain and determine the abundance of other marine life, from the amount of fish in the sea to the number of polar bears on the Arctic ice (see: The importance of plankton). The phytoplankton do more than underpin the marine food chain however, as they also play a central role in the global carbon cycle by influencing the atmospheric composition of the greenhouse gas carbon dioxide. Over hundreds of millions of years the burial of some of the organic carbon fixed by phytoplankton photosynthesis sequestered carbon in the sediments; some of this became the Earth’s oil and gas reserves. Likewise, over similar time-scales, the burial of inorganic carbon in the calcium carbonate remains of phytoplankton coccolithophores sequestered carbon in deposits we now know as chalk. It is changes in the rates of phytoplankton growth and carbon fixation that are thought to have played an important role as feedback mechanisms driving climate change during glacial / interglacial periods. For example, as global temperatures cooled as the Earth entered a glacial period, it is suggested that steeper temperature gradients would have developed between the poles and the equator strengthening winds, which are thought to have then blown nutrients from the land to the sea. This increase in nutrients could have acted as a fertiliser promoting phytoplankton growth leading to a greater drawdown of carbon dioxide and a further cooling of the atmosphere. So, as you can see, the phytoplankton play an important role on Earth despite their diminutive size, which is why a paper published by 3 Canadian Scientists in Nature in 2010 (http://bit.ly/1OwkMze and http://bit.ly/1Q4HseL) caused quite a stir. The authors of the Nature paper led by Daniel Boyce used a 100-year data set to see if phytoplankton had changed in their abundance in the sea. Their results suggested that the phytoplankton had reduced in abundance globally by 40% since 1950, or a decline of about 1% per year. They suggested that warming seas due to climate change might have led to increased stratification (layering) reducing the supply of nutrients to the surface from deeper waters; in essence, the supply of fertiliser to the surface promoting phytoplankton growth had reduced. The Canadian scientists study was controversial however. Other scientists thought they saw different results and the study was also criticised on the fact that it combined data on phytoplankton collected in very different ways. The earlier part of the data set used Secchi Depths as a measure of phytoplankton (more about Secchi Depths in a later blog) and the later part used measurements of chlorophyll abundance. Fast forward to the last three months of 2015 and three new studies on phytoplankton abundance were published in quick succession. The first of these by Cecile Rousseau and Watson Gregg looked at satellite ocean colour and environmental data, and reported that diatoms had declined by more than 1 percent per year from 1998 to 2012 globally (the 15-year period the scientists studied) leading to changes in both phytoplankton abundance and community composition. Losses of diatoms were most significant in the North Pacific, the North Indian, and the Equatorial Indian oceans (http://bit.ly/1Rhd5kg and http://bit.ly/1W5oJOv). The scientists’ study suggested that a likely cause was a shallowing of the mixed-layer by 1.8 meters (5.9 feet). The mixed-layer is the uppermost layer of ocean water and a shallowing would reduce the nutrients available for phytoplankton growth. Why the mixed layer shallowed is still uncertain. One possibility the scientists suggested is a change in wind. A collection of diatoms ©Richard Kirby. About 50% of the primary production on Earth takes place in the oceans and diatoms are the most important photosynthetic eukaryotes accounting for about 40% of total marine primary production. However, the second study, also published in October 2015, and led by Michael Behrenfeld (http://bit.ly/1Pgwj74) suggested that there is an inherent error in the algorithm we use to convert satellite measures of ocean colour (an estimation of chlorophyll abundance) into phytoplankton biomass. Phytoplankton can alter the amount of chlorophyll in their cells depending upon light intensity and nutrients. As a result, the scientists suggested that contemporary relationships between chlorophyll changes derived from satellite measures of ocean colour, are not indicative of proportional changes in productivity; light-driven decreases in chlorophyll can be associated with constant or even increased photosynthesis. In other words, failing to take account of this feature introduces a source of error causing temporal anomalies in surface chlorophyll to over-represent associated changes in mixed-layer productivity. The third study published in November 2015 by lead author Sara Rivero-Calle (http://bit.ly/1PJEzOs and http://bit.ly/1LFI9T5) looked at the abundance of coccolithophores in the North Atlantic over the last 45 years. Coccolithophores are the phytoplankton that surround their cells with plates of calcium carbonate. These authors found that the relative abundance of coccolithophores had increased 10 times, or by an order of magnitude, during this 45-year period. During the same period the authors found that the relative abundance of other species such as diatoms, had declined in some places. To explain the increase in coccolithophores the authors suggested that they may be taking advantage of the extra carbon from carbon dioxide dissolved in seawater as a result of rising levels of atmospheric carbon dioxide. Interestingly, in the geological record, coccolithophores have been typically more abundant during Earth’s warm interglacial and high CO2 periods. Now, at the beginning of 2016, a new paper titled “A reduction in marine primary productivity driven by rapid warming over the tropical Indian Ocean” has just been published in the Journal Geophysical Research Letters – http://bit.ly/1PvYhcQ. In the paper led by author Matthew Koll Roxy from the Centre for Climate Change Research at the Indian Institute of Tropical Meteorology, data is presented demonstrating a decline in phytoplankton in the western Indian Ocean by up to 20% over the last 60 years. The western Indian Ocean shows the largest warming trend among the tropical oceans and the study’s authors found the downward trend in phytoplankton could be explained by a reduction in nutrients reaching the surface form deeper waters due to increased stratification of the water column. 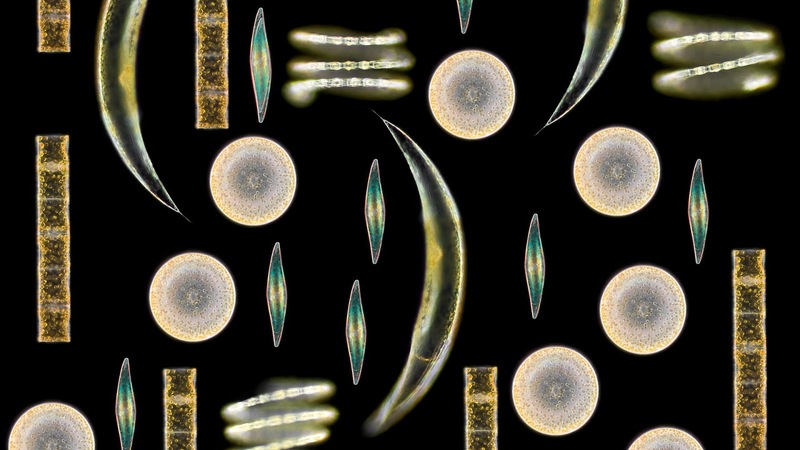 So what’s happening to the ocean’s phytoplankton at a global scale? I’d say there is both mounting evidence that phytoplankton populations are changing globally and that we need to understand how we study them, and as a result we urgently need much more research. As I explained above, these tiny organisms are central to the marine food chain and the global carbon cycle and consequently, I’d argue, it is imperative to understand what is happening to help us appreciate the ramifications of climate change, not just in the oceans but also for our planet. Dr Richard Kirby is a British plankton expert, scientist, author and speaker. Follow Richard @planktonpundit on Twitter. Richard’s book “Ocean Drifters, a secret world beneath the waves” is available on Amazon and as an iBook www.planktonpundit.org.